PTA members: Take poll to select state legislative issues. State PTSA legislative assembly will take place on October 20-21, 2018. Delegates will vote and determine the Top 5 issues to address for the 2019 and 2020 legislative sessions. 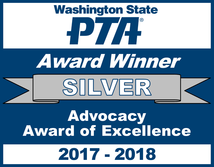 Our advocacy efforts around candidate forums, levy information sessions, health & wellness roundtable and program access roundtable earned silver award for WSPTA.